Lufthansa Miles and More currently has a 20,000 bonus miles offer for new International New York Times subscriptions (6 months). Total cost is €305, which comes down to buying miles at €0,015 each. This is much cheaper than buying miles directly from Miles & More. 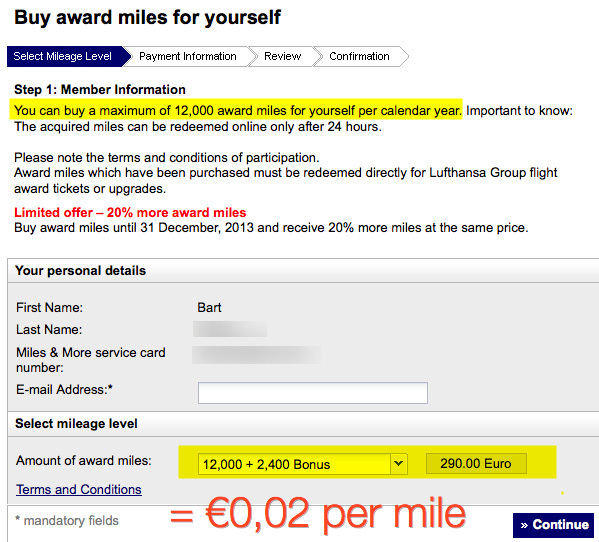 Even with the current 20% bonus, you’re still paying €0,02 per mile and you’re limited to buying 12,000 miles per calendar year. This is a good opportunity if you need to top-off your account for an award reservation. Offer is valid until 25 December, 2013. ← IHG Rewards Club: The Big Win 2014! Greg, the T&C of the offer indicate you cannot cancel the 6 month subscription after you received the miles. It’s not clear to me if these 20k miles can expire or not… I guess not if paid with a Miles & More CC ? Can you cancel after 6 months without losing the 20k miles or are you only allowed to cancel after 12 months ? Michel, if you don’t have status with Miles & More, award miles expires 36 months after you earned them. If you have status with M&M or you have a M&M credit card (and use it at least once a month) your miles do not expire. The NYT offer T&C indicate you cannot cancel your subscription after you have received the miles (to avoid people signing up just for the miles and then requesting a refund) However, the T&C should state 6 months, not 12. I’m quite confident this offer is for 6 months and you will not be forced to extent the subscription for another six months. Do you have to in Europe to get this? I tried a US address and it wouldn’t take. Stuart, the offer is only valid for M&M members of Germany, Switzerland, The Netherlands, Belgium, UK, France, Hong Kong, Singapore and Thailand. No worries, it’s a good deal after all! It seems to work in Italy too. And the price now seems to be lowered at 245,00 €. (in Germany 265,00, in Belgium 305,00). You know if there is a specific date you have to start the subscription or you can choose any date, let say march ? Ales, T&C do not indicate you need to start subscription immediately, so March should be fine. I also noticed you can select Thailand for just 5000 BAHT (€112). Question is if they match the address/country with your Miles & More account. Thanks Bart. I do live in Italy, so the price will be fine. Just wondering if I do really get the 20.000 miles. Merry Xmas !! I think the thai option is a good one for 100 euros. Has anyone got miles with residence in Thailand? I tried to sign up to this, but could not find any reference to a six month sign up when I attempted to progress it (nor anywhere to input my M&M no). There is apparently no expiry date, but I am not convinced this offer is still running. Thanks Bart. Seems like a credible offer. My main concern is the 6/12 month subscription discrepancy, which is repeated in the new offer. I agree with your hunch that this is supposed to be a bonus simply for a six month subscription, but you can’t rely on that – the terms and conditions clearly state otherwise. So, if you cancel after 6 months and they reverse your bonus, you can’t argue. has anyone got 15 000 miles for the subscription in thailand? 5000 THB? Friend of mine is waiting for the miles to be posted. How long would it take for the miles to be posted in your M&M account? Friend of mine used Thai address for this offer and got the 20K miles posted for just 5000 THB (~€110)! Hi all, can you have a uk registered M&M and M&M Card and still get the offer in Thailand? Hi Tom, as stated before, a number of people have reported this worked. Good luck!